By 9:00 we were on the road in front of Nyomoti’s house waiting for our friends to show up to go to the “singing and dancing” school. That’s what I call Malemgamzoma Primary School because the tailors there greet us with song and dance. We had 43 people in the library to learn how to make MoonCatcher kits. About half of the group was 8th graders and the others were women from last year’s group. We cut carriers and compared a good pad with a problem one and asked and answered questions back and forth. Eventually we made two really beautiful carriers using hand cranked sewing machines. I think we will see beautiful work coming from this cooperative. Demonstrating how to cut carriers. We went next to the Bandawe School for the Hearing Impaired. We loved this place. The students there taught us lots of sign language and gave us each “sign names” that described some aspect of our appearance; for example, a gesture mimicking my hair was my name while Charlotte’s sign had to do with two freckles that are on her cheek and jaw. Everyone laughed and smiled a lot and enjoyed spending time together. I was there to teach how to put elastic on the shoelace belt but the minute we got there the power went out, so we just visited instead. Emmanuel, the head tailor is so skilled that with a simple explanation I was sure he understood how to do this task. “Go with the Flow” ... our constant refrain when doing this work. You take what you get and often it’s so much better than you expected. Our new friends at the “singing and dancing” school. We ended the afternoon with a swim in Lake Malawi. None of us had bathing suits but we managed with capris and tank tops and loved every minute of it. A little yoga on the beach made it even more fun. Tomorrow we go to Mzuzu to meet up with our pal Mary who had helped us so much last year. Mary is pregnant and I’m dying to see her five months along and to hear all about her life. We will attend a meeting of a local a Rotary Club on Monday and somewhere during our time there we will find time to buy two treadle machines for the sewing group at the “singing and dancing” school. There were amazing views traveling from Mtunthama to Chituka but it took us most of the day. I loved the expanses of fields, animal shaped mountains and endless skies. Around every corner was yet another magnificent vista. This is an absolutely glorious country. We went to our first school to meet last year’s wonderful tailors. I had only expected to see Patience and some people I’d never met but instead we were greeted with song and dance by the women I had worked with last year and had grown so fond of. I was totally delighted to see them all again. Along with students, they have been making MoonCatcher kits and from what I saw they looked pretty good. 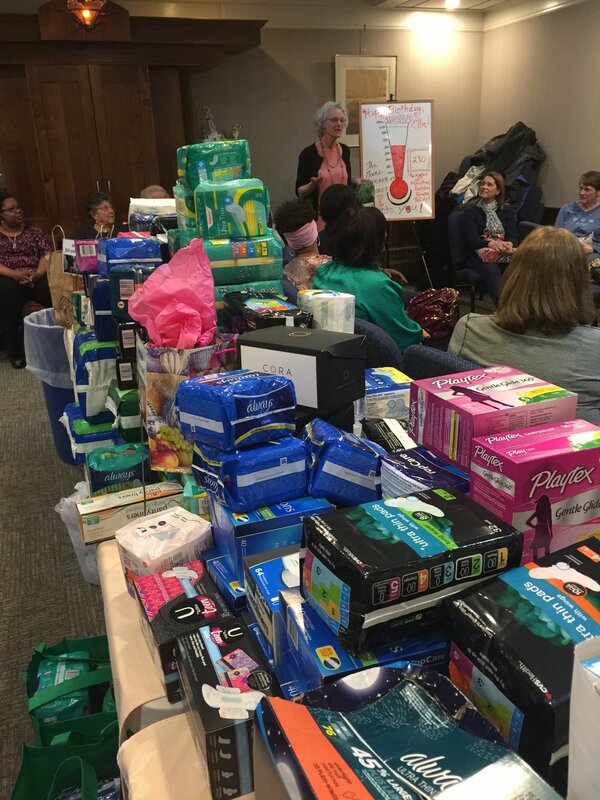 There were introductions, speeches and a lovely little essay delivered by a teen about how much having a menstrual kit means to her and her friends. I was so touched by this. Patience, one of our newest tailors in Chituka. The beautiful sign we brought for our new sewing guild. We will return tomorrow to have an impromptu MoonBee working with students and adults. Later we went to the School for the Deaf. A group of adorable eighth graders met us with big smiles. Nine sewing machines were lined up outside on a patio area for us to inspect. Again, introductions and greetings took place and I found myself wishing that I knew sign language. Hugs and smiles seemed to suffice. Three of these teachers will come to the MoonBee and when it’s over we’ll head back to the school to teach a little on the electric machines. Charlotte spends some time with one of the students. The hotel where we are staying is incredible. It is right on the lake. We put our feet in and marveled at how warm the water is. Hand-made canoes are scattered on the shore with a few out fishing even in the dark. It’s been a long day. It was fun to find a little internet, have a glass of wine and eat a nice dinner. A peek at the stars from out on the beach was a fun prelude to a hot shower. Time to sleep. I’d expected to go to one school today but in the end, we visited three. 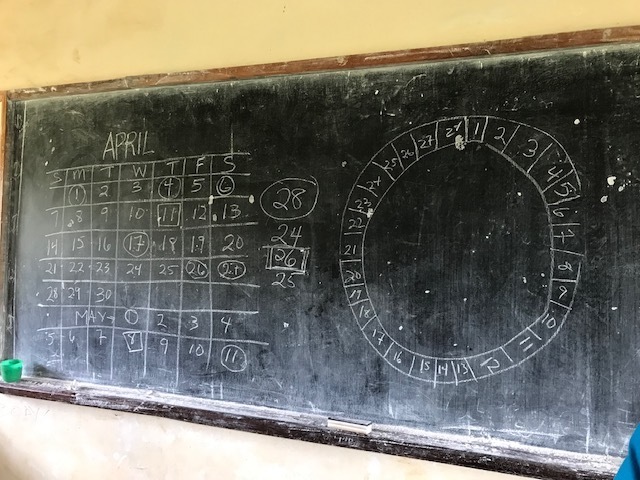 We arrived at an empty secondary school by 10:00 and eventually found the headmaster who told us that the students had left for Easter vacation and only 5 girls were there for us to meet. After some discussion we agreed that he’d get 85 girls to return for a morning class next Tuesday and we’d make the long trek back to deliver our class and kits. We’d noticed a primary school across the road and asked to be introduced by the secondary school principal. He happily walked us over and explained that we’d be happy to talk with the girls there. The class was made up of twelve, thirteen and fourteen-year-olds. Most of them claimed not to have started to menstruate yet and that’s perfect as far as I’m concerned. I wish we could explain menstruation long before a girl gets her first period, and then give her the necessary supplies to be ready and not afraid. Teaching girls about their cycle. Our second school had some English speakers, so I was more helpful when teaching. The girls had great questions, wanted to be nurses, engineers, bank managers, and were cheerful and interested. They sang for us and hammed it up when we asked to take photos. This picture thing brings out the same in children all over the world. We were invited to see the dormitory and I asked to see the toilet. The dorm had three rooms; two bedrooms and a kitchen. the floors were dirt and the children slept 20 to a room on mats on the floor. The kitchen had one small window, a low ceiling and smelled of cooking smoke. The bathroom was made of grasses that had mostly fallen down providing no privacy and the toilets were small spaces with wooden doors and a hole in the floor. The only ventilation was some small holes up towards the ceiling. These smiles say it all. The third school, which we didn’t find out about until our driver announced that we were late, was another hour down the bumpy, dirt road. The views all day were glorious. This is an amazingly beautiful country with some of the best skies I’ve ever seen. It always takes a while for these girls to get over being shy about the topic of menstruation. We try to get them laughing which helps a lot and we usually leave with smiling happy girls surrounding us. We saw the dormitory at this school too. It is a new building, but the wooden beds have no mattresses and the girls say they are scared at night to go to the toilets that are so far away. Six students stood up at the end of the session to read short papers about the challenges they face. Each asked us to help in some particular way. The most I could say was that I’d tell people about them. There is so much need here that it’s difficult to stay focused on our mission: to overcome barriers to menstruation. There are just so many other barriers and challenges! We leave for Chituka tomorrow morning at 7:00. I wanted to leave earlier but we are too tired and it’s just not fair to everyone. I will try to get down to the sewing space early to pack us up and be ready for the trip. We return to Mtunthama on Monday. This morning, I woke to chicken clucking and roosters crowing. I wouldn’t feel at home here if it weren’t for those noisy birds. I think it beats an alarm clock, but I may be in the minority about this. It was sunny and breezy most of the day though we did get a downpour mid-morning, that dried up before we could wonder how to stay dry having forgotten raincoats. We met Olipa at the sewing guild, gathered our MoonCatcher kit packed suitcases and waited for our crew to arrive. Later than planned, but with plenty of time we loaded everything and everyone into a van outfitted with narrow wooden benches along each side. It makes for a bumpy ride, but you can fit lots of people and supplies this way. Our first school had about 120 girls crammed into a classroom two sizes too small, but everyone was in good spirits and happy to be there. Olipa and I had our first experience teaching together. I spoke, she translated. Ends up she knows a lot about the subject, so she added lots of useful information and held the girls in the palm of her hand. They loved her and felt free to ask questions and add to the conversation. Charlotte was our model. She really hammed it up and got the girls screaming with delight. They loved that part. We had our tailors hand out the kits to the girls. Because they had made them, it seemed just right! As Ellie and Olipa show the students the contents of a kit, Charlotte gets ready to be the perfect model! This is why I love coming here. The deputy head teacher asked to show me around the school. He mostly wanted me to see where the girls live. The dormitory was dirty, crowded, messy and in need of mattresses and mosquito nets. The doors have large gaps and the windows are missing most of their panes. The bathroom was worse. There is no door, no place to set anything down and no privacy of any kind. Menstrual supplies are dropped into the hole used to urinate and when that fills up there is no money to clean it out. It’s smelly, dark and unfriendly. The kitchen was smoky and had chickens roosting on and under the counters. Yet I could tell this guy really wants the best for these girls and was trying his hardest to do right by them. He asked for mattresses and I said I’d see what I could do. Once we dropped everyone off, three of us went into Kasungu to shop twin bed size foam. We found it but have to figure out a way to transport it to the school so haven’t purchased it yet. We’ll work on that tomorrow after teaching at another two schools. I’m so tired. Time to sleep. We woke in Lilongwe, had a leisurely breakfast and left our lovely little house for Mtunthama - where our sewing cooperative is located. We loved our hosts here, Phoebe and Davidson and will miss them. They made us feel so welcomed and pampered. After three stops we were able to find the voltage converters that we need for the electric sewing machines that I’d brought from home. These machines were donated by our generous MoonBee volunteers and will be put to good use here. Once we had the converters, we set off for Mtunthama. It takes about 3 and a half hours to drive there through beautiful farm land and small villages. The clouds that always blow me away here were putting on an amazing display today and the sun shone bright and strong. We stopped once to stretch our legs and watch the outdoor market going on across the street. A few vendors came to visit with us, but we didn’t have any need for cabbages or handmade brooms. It’s always fun to see the beautiful African fabrics tied around women’s waists creating a really colorful scene. A typical road-side in Malawi. Driving into Saint Andrews Hospital compound (where our tailors work in a sewing room donated by the hospital) it felt a little like coming home. We drove straight to Peter and Jackie’s house and were greeted by Jackie with big hugs and smiles. We found our lodging, (I’m pleased to be living with Alice and Andy again) our suitcases and more old friends. Charlotte is living across the compound from me, but she gets to stay with the Anglican priest Father Pedro. His house is warm and friendly and filled with children and guests. She’ll enjoy herself I’m sure. To get there you walk across a field holding the hands of as many children as can hang onto you at once. Charlotte is in love. She’s already worried about saying goodbye in two weeks. We are off to a meeting soon to talk about tomorrow’s schedule for visiting schools in the area. It was warm and sunny today. Like one of those hot, hot, hot summer days that actually feels good after the cold winter. I’m always surprised that all you have to do here is step into the shade and you feel cool and refreshed. I’ve read many books that take place in Africa and they always mention this. I can tell you that it’s absolutely true and I love it. Is it like that at home? I can’t remember. Our Rotarian friends, Lon and Dave, left for a dairy farm where Rotary International is working to expand and update an existing project. It’s dark now and they have yet to return but I’m thinking they probably are having a great time as they were incredibly excited about this venture. It’s been a productive day for us. After three years of coming here I finally feel like I have a sense of how to get the supplies we need to make MoonCatcher kits. Our dear friend Mary who helped us last year was able to direct her sister-in-law, Olipa, to every shop needed and the ones that didn’t have what we wanted directed us to new venues. We started at about 9:30 and were mostly finished by 2:00. Choosing fabric for the drawstring bags. In the middle of our shopping spree I ran out of converted money and asked Olipa if she would help us get more. We drove to a fairly busy parking lot and sat there until Gideon, a hefty and cheerful man slid into Olipa’s seat next to me and conducted business. We were given large piles of Kwacha that needed counting and it took all of us to get it right. We carefully counted with our hands well below the windows and moved the bills back and forth between the seats to each other. There is nothing unusual about this in Malawi but for me it always feels like what I imagine drug deals must be like. Charlotte was in the back seat trying to discourage art dealers from offering to sell her more paintings. She figures the two she brought yesterday are enough and she’s getting pretty good at firmly saying no and closing the window. Fleece fabric for MoonCatcher pads. We had lunch at a little cafe that served yummy cheese and tomato sandwiches with perfect avocado. We went over our purchases to make sure everything had been entered in the “blue book” just the way Linda likes it to make it as easy as possible to do the book keeping. “The Blue Book” goes everywhere with me so that I can carefully keep track of our expenses. We’ve bought enough materials for kits in both Chituka and Mtunthama. The car is bulging at the seams, but we made it all fit with room left over for five passengers. Tomorrow we head to Mtunthama. I’ll get to see the MoonCatcher tailors there and get caught up on their lives. Next will be Chituka where we are planning to establish a second sewing cooperative in Malawi. Charlotte and Olipa packing up for our trip tomorrow. Off to take a shower and relax for the evening. I woke up the other day not being able to easily get out of bed or walk across the room. I’ve twisted and turned my poor back and can barely walk much less sit in a plane for 15 hours. I kept waiting to feel better, went to see the osteopath and iced and heated the affected area diligently but yesterday morning I decided, after lots of angst, that trying to go to Uganda was not going to be possible right now. It feels like I’m letting lots of people down though every single reply to my emails about this change of plans has been answered with understanding and concern. We will reschedule once I feel better. I believe in life lessons. There are probably more here than I now understand but I’m thinking this has something to do with letting go of control and “going with the flow.” Always that MoonCatcher lesson to remember. Let me tell you what has been happening though. We’ve had a bunch of MoonBees and some presentations and people from all over the country are reaching out to us, asking to be part of this project. In Uganda Phoebe, our partner extraordinaire, is going to go to Kasese, the forgotten area in Uganda where we have begun to send our kits. 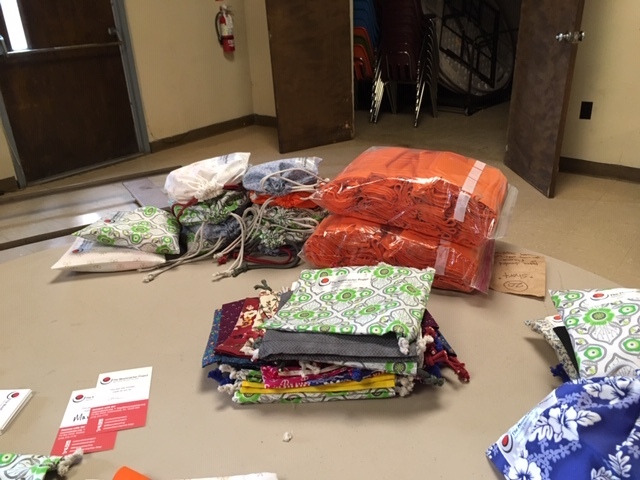 We are gearing up for our visit to Malawi in April and working with a Canadian group that has asked us to provide kits for 150 students in a school near Mtunthama, Malawi where we have our sewing guild. Completed kits ready to go. March 28 is our annual Birthday Bash at Congregation Gates of Heaven in Schenectady. Once again we will collect disposable pads and tampons for people in our own community. We have a link on Amazon for people who can’t come to the party and want to contribute. I’ve been receiving boxes of supplies from people all over the country. 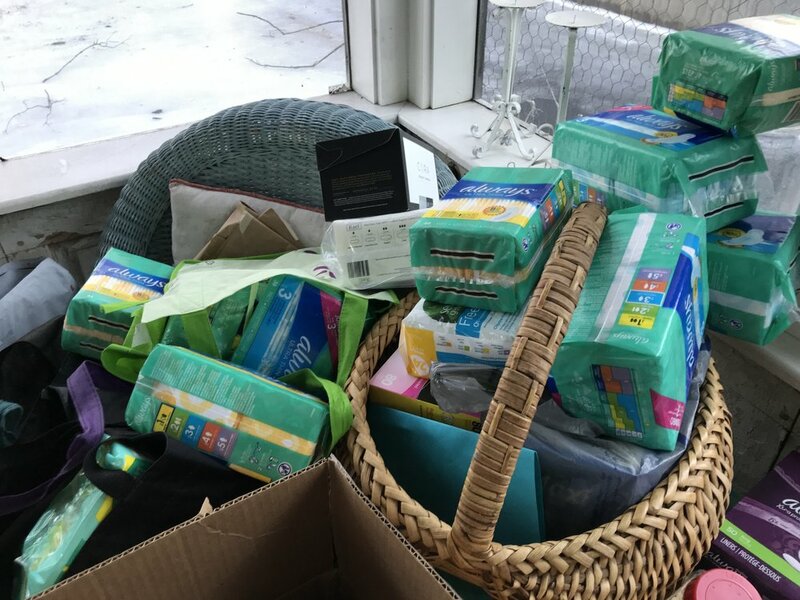 My back porch is beginning to look like the Rite Aid isle filled with menstrual products. I’m delighted. If anyone reading this knows of anyone going to Uganda or Kenya in the next month or so and can carry some of our supplies, we’d appreciate that. Meanwhile I’ll be taking it slowly and doing MoonCatcher work from the couch for a while. I’ve got a good fire blazing in the wood stove and a big mug of squash soup on the table next to me. I’m in Newville, the little hamlet where I grew up and where my family still owns the 200+ year old house. It’s where I go when I want a little time to myself and quiet to do jobs that take full attention. I’m doing lots of paperwork this time. The MoonCatcher Project has had an extremely busy January. I counted ten events - MoonBees and presentations - last month and my calendar shows no sign of letting up. The MoonBee at Union College in January attracted over 70 students and volunteers. 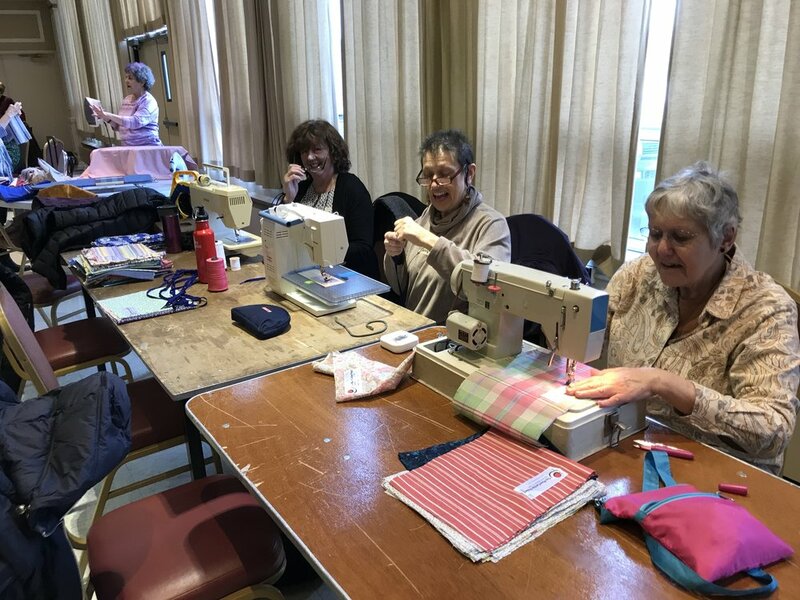 Our wonderful volunteers making MoonCatcher Kits at St. Sophia’s Church in January. Churches, synagogues, schools, quilting clubs and lots of other organizations are reaching out to support us. I’ve even heard from a little non-profit in Australia that is starting to do MoonBees down-under. Packages of unsewn kit parts were mailed this week to Connecticut and California and a Doctor from Nicaragua wants to talk to us next week. It amazes me that all these people find us and want to do something to help. I’m constantly reminded that people like to have hands on work to do when volunteering. There is something so real and primal about working with our hands - being able to touch and feel the process. People come up to me all the time to say thank you. I always feel like it should be the other way around. While all of this activity is going on, and while we prepare for our annual Birthday Bash and a Summer movie night, I am also getting ready for my winter trips to Africa. In March I’ll go to Uganda and Kenya with my dear friend Maureen and in April I head to Malawi with my buddies, Charlotte, Lon and Helen. Lon and Helen are Rotarians and are helping us to apply for Rotary International funding for our work in Uganda and India. 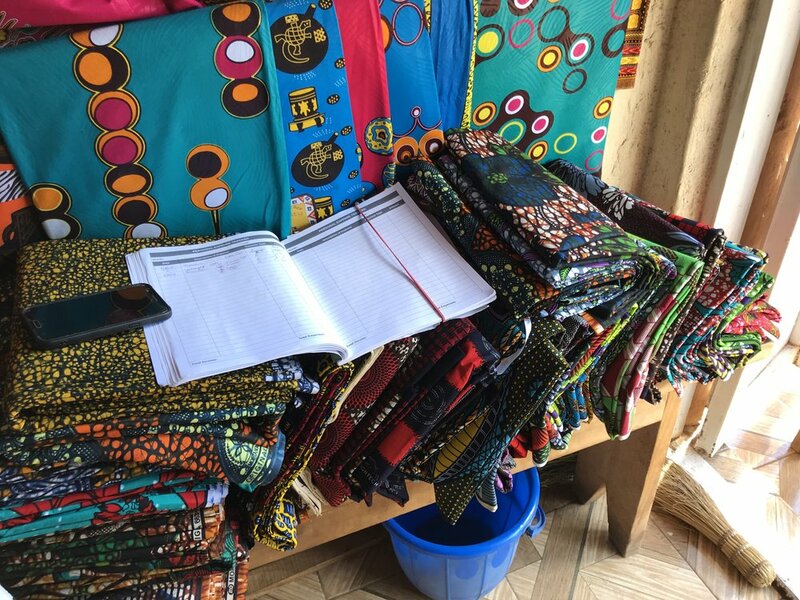 I’m thrilled that I’ll be able to show them The MoonCatcher Project in Malawi where we have an operational sewing guild and many schools that we serve. Charlotte has been coming to MoonBees for years and will teach some art classes as well as help The MoonCatcher Project, Malawi. It’s morning! 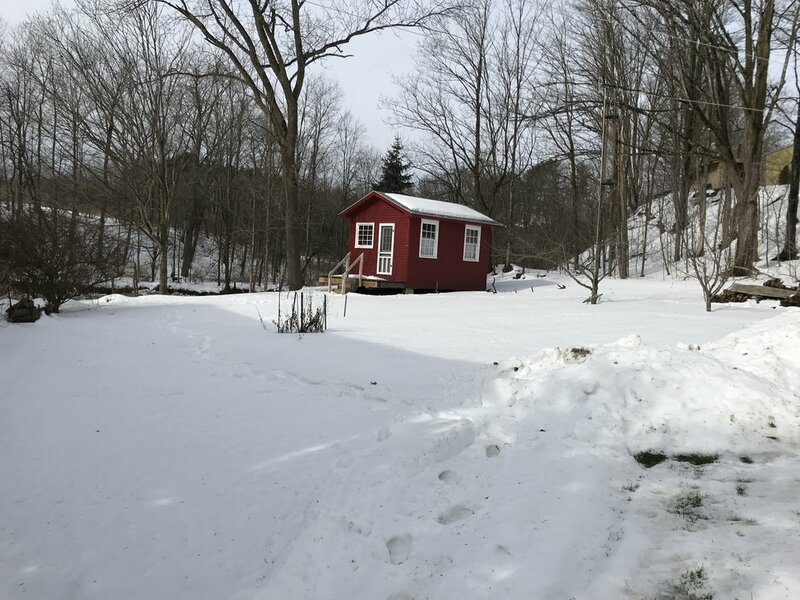 I spent the night in my little red cabin. The creek is high after the warmer weather and loudly rushes pass my windows. Huge icy plates have dammed the other side of the waterway and it looks like I’ve landed on the moon. How different from the red soil and hot climate of Uganda where I’ll be in a few weeks. My little cabin in Newville. This year we are going to spend some time in a new area of Uganda where service work is seldom done but Phoebe tells us the need is great (Kasese District ). 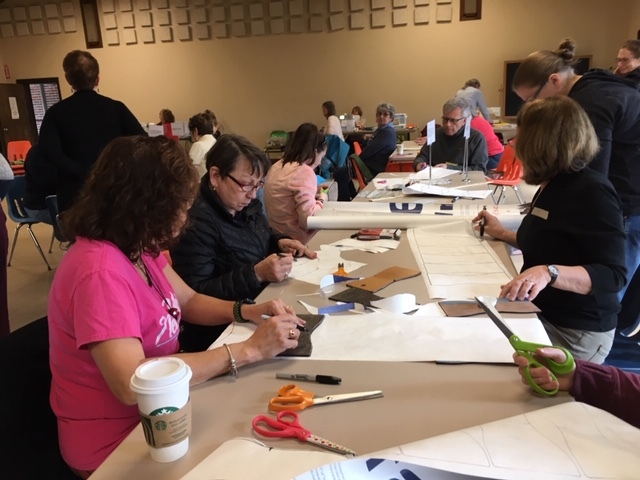 We will also get representatives from each sewing guild together to discuss their work, how we can better serve them and find out what is their capacity for growth. This is our fifth year since establishing The MoonCatcher Project there. It’s time to ask more questions and work in closer collaboration with our tailors and teachers. We’ll spend a day and a half together working and playing. We’ll visit some friends in villages where we already work and spend some time in Kenya with our seamstress, Jackie. We are also hoping to visit some schools there and help teach and distribute kits in Uganda and Kenya. My next blog entry will be from Uganda. I’ll send photos and try to write most days. I know it’s cold out, but sunlight is spilling in over my dining room table as I write this. I can pretend that it isn’t really just 25 degrees. The holidays are over and that’s always bitter sweet. I loved having my children home and my sister Gussie here too and I loved pausing for a while. We had this year’s first board meeting last week. There are financial reports to reconcile and more thank you notes to write but it still felt like putting 2018 to bed and gearing up for this new year. After looking at all we accomplished and the fact that we surpassed our fundraising goals we made some changes in how we do things. Two of our board members were reinstated for three-year terms and new officers were elected. I stepped off the board. We’ve been working towards this for a while now as I want to put all of my energy towards being the director of The MoonCatcher Project and know that wearing one hat is a better model for this. Linda Wistar has become president and John Doyle will serve as treasurer. Ginger Etrz will continue as our beloved secretary. Pisie Hochheim, Agnes Pala-Bukahala and Laura Kikuchi will continue as Board Members. I feel really good about all of this. I know that this board will always stay true to the mission while moving this project forward. I’m starting to organize our Uganda and Kenya trip. I’ve reached out to Phoebe to find out what she feels will be most useful to her. She wants us to spend 3-4 days in a very troubled area of Uganda that is often overlooked by mission groups. We have been making kits for them for several months now and she has promised them that we’d visit. It’s important for us to make these trips as often as we do in order to try to understand what is needed and what improvements we can make. I’m always amazed at what we learn. In April we head for Malawi and I’ve already bought my ticket. I will travel with a wonderful smart young woman, Charlotte Mack, who has lots of enthusiasm for our MoonCatcher work and will be a great help to the project. Two others may go as well but I haven’t gotten the final word on that. My New Year’s resolutions are about reaching more girls and educating more people about The MoonCatcher Project’s mission. I’ve got some new countries in mind and want to expand in the countries that we are already in. I want to expand our disposable supply collections to help women and girls in our community as well. And I want to continue to partner with other organizations working to change the lives of girls. I am so grateful to everyone who helps us. 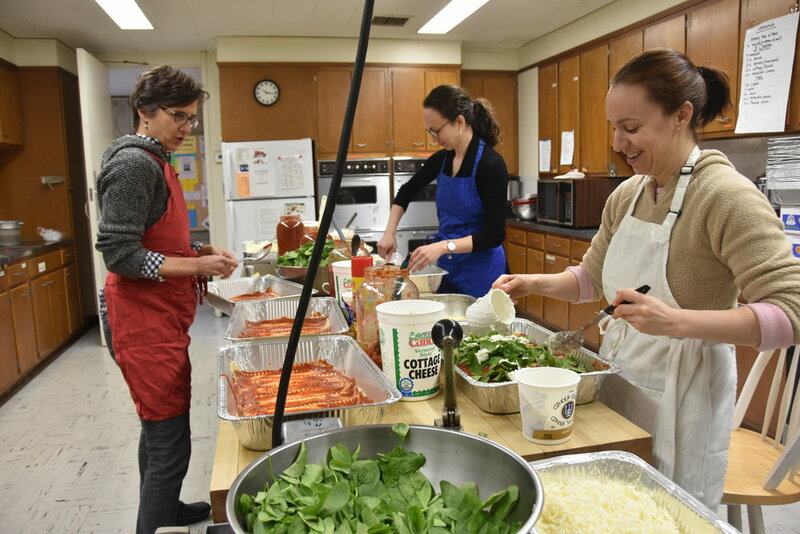 The hands-on work of Dining for Dollars, our annual lasagna dinner fundraiser, is finished. Last Monday, my high school classmate and longtime dear friend, MaryAnn helped me shop at Restaurant Depot in Albany for lasagna supplies. She came all the way from Northampton, MA to do this. I texted her the night before to tell her to wear a warm coat, hat and gloves. We spend a fair amount of time in the cooler choosing our cheeses and veggies and believe me it’s North Pole cold in there. Santa has nothing on us. Then on Wednesday evening we delivered 600 lasagna meals that we’d been working on all day Tuesday and Wednesday. More than 50 volunteers gathered to pull this off. Unbelievable! Every year they show up to cook, pack, bake, drive and clean up. D4$ cooks get started preparing lasagna for 600. Thursday I put boxes of containers and left over tote bags away and Friday my husband Michael and I scoured the Unitarian kitchen from top to bottom. It was left looking pretty darn good but we wanted to be sure that the church didn’t have any reason not to welcome us next year. Michael made every one of the 12 oven racks sparkle. Really! They went from black to silver. I never would have had the patience but he kept at it for hours and they look amazing. 600 Dinners ready for delivery or pick-up. Tomorrow all 52 handwritten thank you notes will be put in the mail and the checks that have come in so far will go to the bank. Now we wait for the rest of the envelopes to come in and when we hear from everyone we’ll send half the money to NOLA and the other half will go to The MoonCatcher Project. In today’s mail: 41 envelopes! I love this event. Even when there is a glitch something magical happens. The woman who didn’t get her lasagna in Saratoga called to say “no worries. I made do. There are people in the world who have nothing. This is such a first world problem”. And then she wished me a happy holiday. Wow! I love the chaos of it as well as the attention to detail. I love trying to make it work better every year and incorporating everyone’s “how can we make it better” ideas. The feeling on the two days of cooking is always friendly and has that vibe of pulling together. Coming from a family of ten siblings this feels like home to me and makes me smile all day long. To those of you who helped, know that I am forever grateful. You are some of the best people I know. And to everyone, Merry Holidays! In July 2017, I was surprised to receive a phone call from the Points of Light Foundation announcing that I had been nominated as a Point of Light. After going through a very rigorous application project, I was awarded this honor. Then, I had only a vague idea of what this meant, but I did recall that Girls Inc. here in Schenectady had earned that distinction. This helped me understand the concept that George H.W. Bush had developed when he was president, to honor organizations and people who volunteer to do good in the world. I was amazed that I would be among them. I must acknowledge that I didn’t vote for George H.W. Bush. However, he has earned my sincere admiration since leaving the White House. I respected how he and Bill Clinton often worked together to help victims of natural disasters here and abroad. Having run 16 volunteer rebuilding trips to New Orleans since Hurricane Katrina, I realized that President Bush was another partner in helping others. I particularly respected how these two past presidents were cooperating in a generous, bipartisan spirit to do good, together. I woke up this morning recognizing I wanted to say something about this remarkable man. He supported citizenship in an idealistic but practical way. He supported the Peace Corps and foreign aid in ways to foster the aspirations of so many around the world. In these helpful actions, and in establishing the Thousand Points of Light, I appreciate that he was a decent and kind man, a gentleman. Rest in Peace President Bush. The MoonCatcher Project has been busy gearing up for our end of the year campaign and Dining for Dollars fundraiser. I love the energy and excitement of it all but relish the time each morning when I can just sit and reflect a little. I usually wake up around 5:30. I pad downstairs, make coffee and at this time of year sit under a cozy quilt to write for twenty or thirty minutes. I’ve been doing this for 26 years - starting the day putting down onto paper, longhand, what’s cluttering up my head. This helps me start the day with a some clarity and focus. I then meditate for a few minutes and then I’m as ready as I’m going to be to jump into whatever the day holds. We have had a full calendar of MoonBees lately and more are booked into February. I am so grateful that board member and dear friend Ginger has taken on the role of “calendar girl”. She communicates with churches, synagogues, community centers, schools, and individuals to schedule MoonBees and presentations. Having that work load taken off my plate has freed me up to pay attention to many other things. I wasn’t aware of how much time this was taking until I didn’t have to do it anymore. Thank you dear Ginger. Because of the additional MoonBees we have been able to send more kits to more countries. Swaziland has been added to our list and we have sent more kits to Haiti and Ghana too. Sewers from around the country continue to ask for packages of unsewn parts to make at home or with their schools or churches so I’ve been bundling up parcels to take to the post office. I love how this project has spread throughout the United States to people who have become friends though I’ve never seen or talked to them. Email connects us. The MoonCatcher Project annual report has been emailed to about 1,500 people and snail-mailed to hundreds more. It’s amazing to read what we have been able to accomplish this year. When I’m in the throws of making things happen I lose track of all the work this project does - with the help of hundreds of volunteers. The report puts all the information in one place and amazes me when I read it. All our board members, tailors in other countries and volunteers from across the globe are making this beautiful connection with girls throughout the world and helping to change their lives. Thank you everyone. Take a look at what girls in Delhi have to say about their new MoonCatcher Kits! It’s been twelve days since we returned from India. The jet lag has disappeared and I’m beginning to really appreciate what we were able to accomplish. The Shashi Kiran Charitable Trust, in Delhi, is partnering with us to move The MoonCatcher Project (MCP) forward in India. We are so grateful for their help as we negotiate this new country. We truly couldn’t do this without them. Thank you to this great organization! I miss the wonderful tailors that we found in India. These lovely women are such skilled seamstresses. It was a treat working together and sharing The MoonCatcher Project story. And an added pleasure for me was having industrial machines to work on since this is what I grew up with. My father must be smiling somewhere watching this unfold. The MoonCatcher Team in Delhi. We set up a beautiful, light and airy sewing space with these women. They are making two hundred kits every week, exceeding our projected goal of one hundred seventy-five. Wow! Their work is beautiful. Each woman pays careful attention to quality control and they all check each other’s work so that nothing will leave the room less than perfect. This makes me smile as I am a stickler for quality. I want each girl to receive a kit that is beautifully made and reflects the respect MCP has for her. While in India, we were able to visit two schools to teach our class and more are being contacted to visit in December by our representative in India. The girls of India are receptive and eager to hear about menstrual management and reproductive health. We laughed with them as we discussed this delicate subject and tried to make it a comfortable topic. Being with girls is always my favorite part of this work. We have a new survey to help us track the number of girls served and the retention of girls in each school. We are hoping that in-house teachers will be willing to help answer questions that may arise for the students and that they will be ongoing support for the students. A power point presentation for The School of Social Work was well received with over sixty students both male and female in the room. They asked thoughtful questions and took lots of photos. Several students stepped up to say they would like to help. This is great as we’ll eventually need more help teaching our menstrual management and reproductive health curriculum to our school girls. During our stay, we spent a lot of time sourcing fabrics, approving notions, and ordering necessities such as Tyvek. We worked hard to try to understand this beautiful, interesting culture and are excited about working together to help girls stay in school. Now that we’re home I realize that the hard work of fundraising begins. This is an ambitious project that we’ve started. Making 200 kits a week, paying rent, utilities and labor are constant expenses. We’ve had help getting our new project started but will need to bring in more funds to keep it going. As our year-end fundraising campaign begins we will be counting on our donors to help us continue the work of this project. I can’t tell you how grateful I always am for everyone’s help. Thank you all so very much! The flight home is something like 17 hours so already I am having trouble remembering our last day in Delhi. I do remember that we spent the day with our incredible sewers. Cording and shoelaces arrived so we were able to teach the final steps of kit assembly and that felt good. I love completion as any of my siblings would tell you and agree. I’m bringing 600 laces home with me for MoonBees. Mid-afternoon Sushma’s (one of the cutters) little son and daughter came into the sewing room with brightly wrapped packages, one for each of us. It will be Diwali next week and these were early surprises to honor the holiday. What a sweet thing to do. Later at chai time we gave out boxes of sweets and after hugs all around left to pick up our bags and head to the airport. Both of us felt sad to be leaving our new dear friends. Anju, the new supervisor, will take over now. We traveled through the streets of Delhi loaded down with suitcases. The air is especially bad at this time of year due to burning of the crops. We could see fires in the distance with black smoke billowing into the sky. One afternoon I was sure it was going to rain. You know the way the sky goes dark and the light gets grey yellow and then it just dumps? The thing is that the rain part doesn’t happen, but the color changes do. I worry for this city but read that new laws are being passed to encourage the end of crop burning and other polluting practices. I hope this works. I worry for all those school children who are breathing this air and all the people of Delhi whose health is being compromised. One last walk down the street where our new cooperative is located. We are weary but as I sit here in Boston, ready to take a nap, I feel like we accomplished a lot. 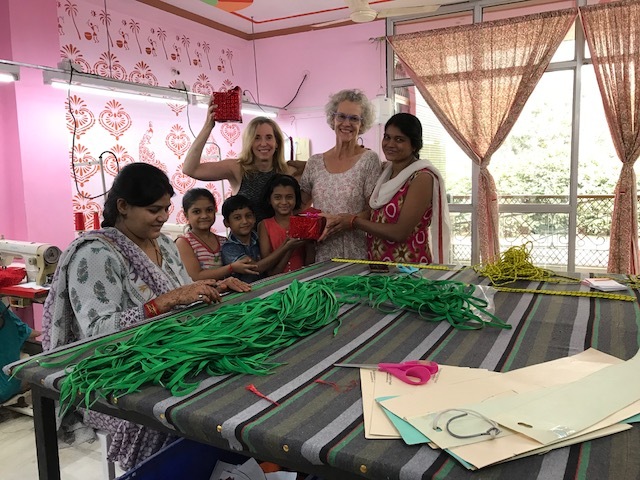 We have a sewing cooperative in India! We didn’t have to be anywhere this morning until 11:00 so I stayed in bed, wrote and then read my book for a while. That felt really nice. Once up, Maureen and I inventoried the extra fabrics we had bought for future kits, finished writing up the yardage and started to pack our bags to be sure we have enough room for all the sale items and our own personal stuff. It all looks doable. We’ll use the extra space that we found for shoelaces. Here they cost half the price of the ones at home so it seems like a good idea to carry some back with us. We use these shoelaces as our belt to hold up the MoonCatcher carrier. What a great find. Our driver Mani Ram came to take us to Laura’s hotel down near the train station, about a forty minute drive away. Laura Kikuchi is on The MoonCatcher board and is traveling in India for two weeks with her Mom. They’ve worked out a wonderful itinerary for themselves and will have a really great adventure. That forty minute drive turned into about an hour because of an incredible traffic jam just around the corner from the hotel. It was mesmerizing watching all these vehicles figure out how to untangle from this. We were in touch with Laura so able to just “go with the flow” and not worry that she’d be concerned. We had a delicious lunch together and then took a little stroll down the street dodging the traffic and enjoying the energy. Our traveling friends were tired and a little dazed but we had fun and were so happy to connect in this far off land. Here’s hoping you have a fabulous trip dear Laura. We went to meet with a local Rotary Club tonight. We were invited to do a short presentation about The MoonCatcher Project in hopes that they would like to partner with our home Rotary Club for a global grant to help move this project forward in India. They were very receptive and agreed that there is a great need for this work. We will now let the two clubs talk to each other. This could be really exciting! Yesterday (Day 11) was another day of sewing and today was busy busy busy! I went off to the sewing center and left Maureen behind to do computer work and catch up with herself. I interviewed two potential candidates for supervisor position of the sewing space. Two lovely women, each with unique skills came to apply for the job. I’m not sure which one would be best. One can start on next Wednesday and the other on the fifteenth. That about cinches it for me since I leave next Tuesday, and we need someone to be there to let the sewers in and keep track of things by the 31st. We spent some time with a lovely man who came to explain how the pay roll works and everyone had a chance to voice their concerns and get the details ironed out. it seems everyone is pleased with the end result. This is difficult for me since I don’t understand the intricacies of India law around these things though I do keep asking questions. I so want these wonderful women to feel happy doing this work and being part of The MoonCatcher Project. Our new friend Vicrum came over with his beautiful wife to take a look at the place today. He had such nice things to say about the order of everything and the efficiency. That meant a lot to me since he runs a factory of over two hundred people. This is small potatoes for him, so it was especially kind that he took the time and was so generous with his praise. The lights came on and off all day, so we had to keep moving sewers to the cutting tables or to stringing cording or packing. It’s hard to have five women around our not-so-big table all working but somehow we managed, and everyone was good natured about it. I love it that we laugh even though we don’t speak the same language. I somehow feel like I know these women though we speak only in gestures and smiles. Maureen came later in the day and everyone was happy to see her. At the end of the day one of our sewers offered to paint our hands with henna. It was so much fun to see how this is done. I had no idea that it goes on in a thick line squeezed from a little, delicate, pastry-like tube and is done freehand by the artist. The designs are intricate and elegant. We loved the whole process. After about 45 minutes my hands started to itch and apparently that can be a signal that it’s time to brush and then wash the dried upper coating off. What appears looks soft and dull. I was a little disappointed until I was told that by morning it would be dark and gorgeous. I’m excited to see how it will look.